Did you know that yesterday was 'Gnocchi Day'? Of course, I happen to find out about this just one day late - and one week after I whipped up some delicious, feather-light sweet potato gnocchi. The good news is that we only have to wait one month until it's Gnocchi Day again (lest you begin to think I'm crazy or making all this up, here's the Wikipedia article that proves it...because everyone knows that Wikipedia is the very highest standard in incontrovertible, scholarly proof). Apparently, in some parts of South America, particularly Argentina and Uruguay, the 29th of every month is Gnocchi Day, or Dia de Ñoquis. You can catch a bit of the backstory here, but the important takeaway is that there's now a dedicated day, every month (well, except most Februarys) when you have full and free license to stuff your face with delicious pillows of potato pasta. As if you needed any excuse! 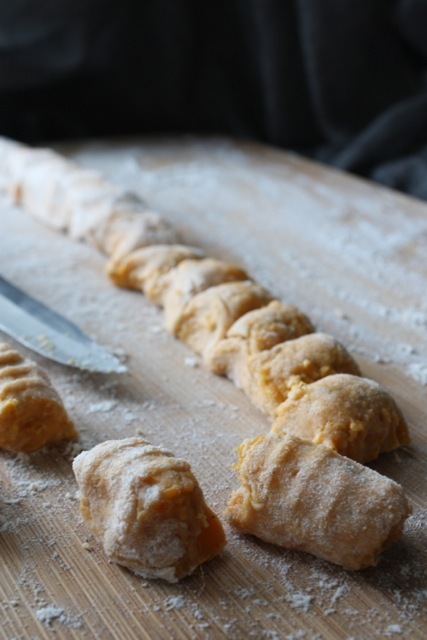 I've a shared a gnocchi recipe on this blog before - in fact, it was my first-ever homemade gnocchi experience - but this one is a little different: it's made with sweet potatoes. If you want a bit of information about the history of the dish, as well as a very detailed method for creating the perfect gnocchi, I recommend reading that earlier post. I also heartily recommend that recipe for first-time gnocchi makers because it's pretty foolproof and delivers light, airy gnocchi almost every time. Today's recipe, for me anyway, has been a bit more finicky. In fact, my first try of the original recipe yielded dough much too soft to shape. The gnocchi may have been light, but they were amorphous blobs that fell apart at the slightest touch. I've played with some of the quantities since, and come up with a version that worked well for me - I hope it will for you also. If you can manage the rolling technique and find the line between overworked and under-floured (the trick is to work and flour the dough as little as possible, to keep it light but still manageable), this recipe yields wonderfully flavorful pillows of perfection. I love the bit of sweetness from the potatoes paired with the savory parmesan, but the flavor of the gnocchi is subtle, so don't drown it in strong sauces. Browned butter and sage is a good choice, as is a light pesto, or just some olive oil and a sprinkling of grated, aged cheese. Preheat over to 350°F. Cover a baking pan with foil. Using a fork, poke a few holes in each sweet potato to allow steam to escape during cooking. Place on prepared pan and bake until tender, about 45-60 minutes. Remove from oven and allow to cool until they can be safely handled. At this time, peel the potatoes, mash or rice them and allow them to cool completely in the refrigerator (it's important that they not be the slightest bit hot). When potatoes are cool, transfer to a mixing bowl and combine with the flour, sage, salt, pepper, nutmeg and cheese. Stir gently until just combined. You should add only as much flour as is necessary for the dough to just come together - it will still be soft and somewhat sticky. On a well floured surface, divide the dough into roughly 5 or 6 fist-sized pieces. Be sure to flour your hands before working, if your dough is at all sticky. Working with one piece at a time, roll each piece into a long rope about 1-inch in diameter. Using a sharp knife, cut dough into 1-inch pieces (I cut mine smaller for greater surface area and sauce-absorbing power!). Roll each piece over the tines of a fork to create the characteristic ridges (these aren't just pretty, they help the sauce stick), pr use a gnocchi board if you have one. 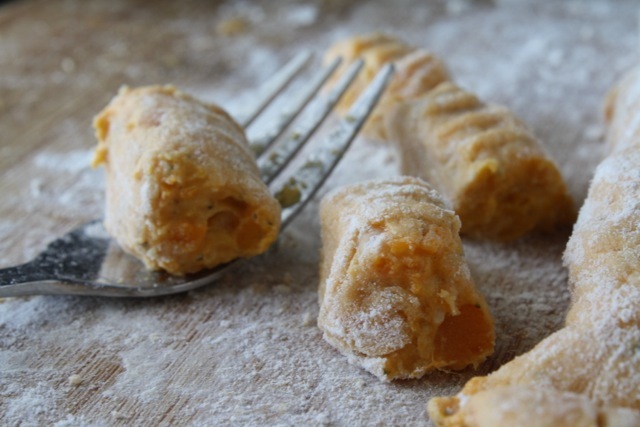 Collect the formed gnocchi on a floured baking sheet. When your gnocchi are formed, bring a large pot of salted water to a boil. Drop the gnocchi gently into the boiling water. It's best to work in batches so that the water stays on the boil and so you don't crowd the pot. The gnocchi are ready when they rise to the surface (this should take no more than a couple of minutes). Remove them to a clean baking sheet with a slotted spoon and allow them to cool thoroughly. For Browned Butter and Sage version: Heat butter in a large skillet over medium-high heat. Allow butter to sit until it has completely melted and the edges begin to brown (butter may foam slightly as the milk solids separate, this is normal!). It should smell rich and nutty, not acrid or burnt. Stir browned butter and add sage, cooking for just 20-30 seconds more. Be careful not to burn the butter (you'll know it because it starts to smell acrid and turns from rich caramel to dark, dark brown) as this will make your sauce bitter. Add gnocchi to sauce and toss gently to coat, taking care not to mash them with your utensils (top tip: you can make the sauce a bit creamier by adding a few spoonfuls of the leftover pasta water). Heat until just warmed, then add pepper and salt to taste. Serve with a light dusting of shaved Parmesan cheese. A few notes: You can find more on gnocchi rolling technique here. This recipe makes a lot of gnocchi, so if you're not feeding an entire familia, I recommend freezing or refrigerating the leftovers. Gnocchi are best frozen after boiling, but before you cook them in the browned butter sauce. Freeze them on a baking sheet, then store in a ziploc or airtight container for up to a month. Then, all you need to do is thaw them and warm them in you skillet with your sauce of choice. If you've already cooked them with sauce, I recommend refrigeration. The leftovers are great as-is, or thrown in with some scrambled eggs for a great breakfast/brunch. If you're really ambitious, you can even turn them into gnocchi mac & cheese! This looks delish! 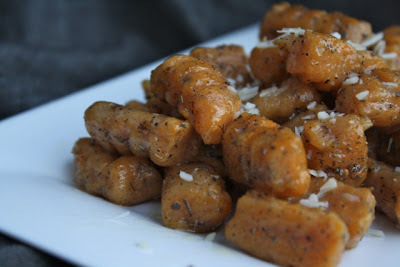 I love sweet potatos gnocchi especially in brown butter sauce. Pinning now! Wow these look fabulous! 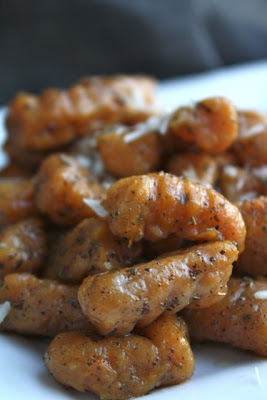 I LOVE gnocchi, and have never thought of making sweet potato ones! Sounds just amazing! I've never made gnocchi before, but this recipe sounds like something I could definitely make. It looks amazing and the sauce must be gorgeous. Pinned! Ooooh! I just found potato gnocchi at the store the other day and am excited to try it with some olive oil and garlic. Now I want to try yours too! Looks delicious. My first attempt at making gnocchi was sweet potato - it's amazing paired with a light alfredo sauce. This looks delightful too, bet the browned butter adds an extra special level of flavor to the dish. I love that you introduce me to new foods Rachel!! Thanks for sharing at oopsey daisy! 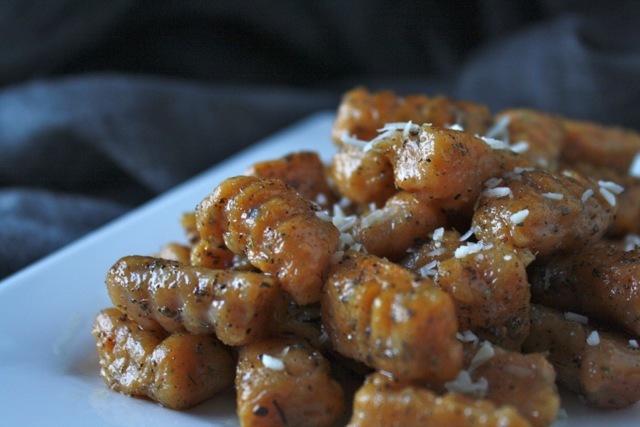 OK, I never imaged sweet potato gnocchi but this sounds heavenly. Please share this and any other of your recipes you like on my Foodie Friday linky today. Wow, these look so delicious! I hope you will come link it up at the Pinworthy Project Link Party going on now over on my blog, Just Us Four. I love that you played with the recipe to make it work for you. I have the most difficulty with this, but I'm learning. Thanks so much for sharing at Whimsy Wednesdays! Another great looking recipe from you! Thanks for sharing! Simple and Clean recipe, must try at home. Please follow my blog http://themichellefactorsencond.blogspot.com/ and drop some comments. WOW! Wonderful - came out perfect - thanks to your step by step - all details appreciated - directions! Will make this again and again! Thank you for sharing! !